Senate Republicans all but abandoned their attempts to overhaul the nation’s health-care system this week after a lastditch effort to repeal Obamacare collapsed in disarray, dealing a major blow to President Trump’s legislative agenda. Senate Majority Leader Mitch McConnell (R-Ky.) had originally intended to hold a vote on the GOP’s health-care bill, known as the Better Care Reconciliation Act—but was forced to abandon the legislation after four Republican senators came out against it, leaving him at least two votes short of the necessary 50. McConnell moved to a fallback plan to vote to abolish major parts of the Affordable Care Act in two years without an immediate replacement, but that effort also sank when three moderate Republican senators pledged to oppose it, saying it would irresponsibly cause chaos on the insurance exchanges offering individual policies. “I did not come to Washington to hurt people,” said Shelley Moore Capito (R-W.Va.), one of the defecting Republicans. McConnell said he would still schedule a procedural vote on the repeal-alone plan “early next week,” though he conceded it was unlikely to pass. 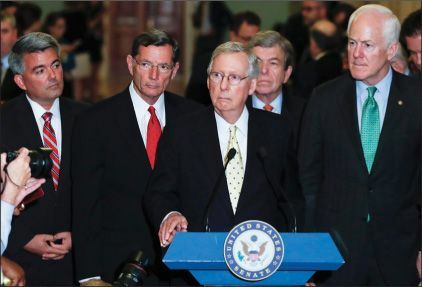 “It’s pretty obvious we’ve had difficulty getting 50 votes,” McConnell said. Trump said he was “disappointed” with his party’s failure to repeal Obamacare, and at a White House lunch for all 52 Republican senators, he pressed them to pass “an even better” health-care bill before the August recess. “Inaction is not an option,” said Trump. If Republicans were unable to revive their repeal-and-replace legislation, he said, he would “let Obamacare fail” and blame Democrats for refusing to work with Republicans on a replacement. “I’m not going to own it,” he said. The GOP’s self-inflicted health-care fiasco “is one of the great political failures in recent U.S. history,” said The Wall Street Journal. Republicans campaigned for years on undoing President Obama’s ill-advised signature health-care policy. Now they finally have a majority in the House and Senate and “a president willing to sign literally any bill that lands on his desk, but in the clutch they choked.” If Republicans can’t fulfill their basic promises, why should voters elect them? This defeat shows that “conservatism is in retreat,” said Josh Kraushaar in NationalJournal.com. Republicans never made a strong free-market case for Obamacare repeal—arguing, for example, that requiring businesses to offer health insurance “stunts growth,” or that soaring “public spending on health care crowds out necessary resources for other priorities.” Instead, Republicans pretended that “more people would be covered as a result of the GOP’s reform,” which was not true and not the goal of their efforts. They got “trapped into playing the opposition’s game”—and lost.